The President of the Senate, Bukola Saraki, his deputy, Ike Ekweremadu, and two others, accused of forgery, have pleaded not guilty to the charges against them. They were granted bail after their arraignment but Justice Haliru Yusuf ruled that they should be detained at the Kuje Maximum Prison in Abuja pending when they meet their bail conditions. The accused are expected to provide two sureties each with evidence of properties in Wuse, Asokoro, Maitama and Garki areas of Abuja. Mr. Saraki’s lawyer, Paul Erokoro, later told journalists that his client had met the bail condition and was proceeding home. All four defendants were later seen leaving the court premises the way they came. 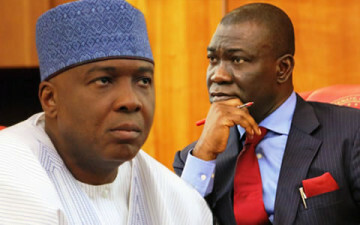 Mr. Saraki, Mr. Ekweremadu, a former Clerk of the National Assembly, Salisu Maikasuwa, and his deputy, Benedict Efeturi, are accused of illegally altering the Senate’s Standing Rule used in electing leaders and inaugurating the upper legislative chamber on June 9, 2015. The trial began Monday after Justice Yusuf of the Federal Capital Territory High Court in Abuja asked the prosecution to issue notice of summons for the matter to the defendants by pasting it on the notice board of the National Assembly on June 21. The four accused persons immediately filed bail applications separately to prevent a possible detention after the hearing. Reacting to the application for bail the Director of Public Prosecution, office of the Attorney-General of the Federation, Mohammed Diri, asked for time to allow him file a counter affidavit. Subsequently the case was stood down for one hour. Outside the court premises a group of protesters were seeing carrying placards and chanting, “Defend our democracy”, “let democracy prevail”, among others.